It is as a human being ever striving upward that I would portray John Muir. From his early boyhood to his old age this spirit dominated him. As a child in Scotland, at every opportunity, in spite of parental prohibitions, and notwithstanding the certainty of punishment upon his return, he would steal away to the green fields and the seashore, eagerly interested in everything alive. "Oftentimes on a broad meadow near Dunbar we stood for hours enjoying their marvelous singing and soaring. From the grass where the nest was hidden the male would suddenly rise, as straight as if shot up, to a height of perhaps thirty or forty feet, and, sustaining himself with rapid wing-beats, pour down the most delicious melody, sweet and clear and strong, overflowing all bounds, then suddenly he would soar higher again and again, ever higher and higher, soaring and singing until lost to sight even in perfectly clear days, and oftentimes in cloudy weather 'far in the downy cloud' . . . and still the music came pouring down to us in glorious profusion, from a height far above our vision, requiring marvelous power of wing and marvelous power of voice, for that rich, delicious, soft, and yet clear music was distinctly heard long after the bird was out of sight." At the age of eleven Muir with his father to America to a farm beside a lake a few miles from Portage. His interest in the life of the wilderness, new to him, was thrilling. When first on Fountain Lake meadow he saw the lightning bugs, he thought to himself2 "that the whole wonderful fairy show must be in my eyes; for only in fighting, when my eyes were struck, had I ever seen anything in the least like it. But when I asked my brother if he saw anything strange in the meadow, he said: 'Yes, it's all covered with shaky firesparks.' Then I guessed it might be something outside of us." Again when first he heard partridge drumming he thought3, "It must be made by some strange disturbance in my head or stomach, but as all seemed serene within, I asked David whether he heard anything queer. 'Yes', he said, 'I hear something saying boomp, boomp, boomp, and I'm wondering at it.' Then I was half satisfied that the source of the mysterious sound must be in something outside of us, coming perhaps from the ground or from some ghost or bogie or woodland fairy." Every boy who has grown up in Wisconsin and has a tinge of the love of nature will appreciate how accurately does John Muir tell of the feelings inspired in the heart of the lad, after the long cold winter, by the first migrating birds and the early spring flowers. The robin and the bluebird declare that spring is approaching, and the pasque flower shouts that spring has arrived. Muir became intimately familiar with the southern Wisconsin flowers. He knew the gorgeous white water lily, the deliciously perfumed, delicate lady slipper, white, pink, and yellow, the scarlet painted cup, the nodding trillium and all the other beautiful early spring flowers so dear to the Wisconsin country children. The life of the boy on the farm in pioneer days was one of hard work, and that of Muir was exceptionally hard; but he differed from the majority of his fellows in that he was not content simply to become a plowboy. Notwithstanding the prolonged physical labor his inner spirit expressed itself, in the summer by his love of out of doors, and in the winter by study and mechanical invention. After leaving school in Scotland at the age of eleven, Muir had little further opportunity as a boy for formal instruction. He succeeded, however, in persuading his father to get for him a higher arithmetic; and in the ends of the afternoons and in the evenings after the day's work he mastered the book; he followed this by algebra, geometry, and trigonometry. From the neighbors, and in various ways, he possessed himself of Scott's novels and the volumes of a number of the poets, including Shakespere and Milton; and also he read the Pilgrims Progress, Josephus and similar works. In the winter, immediately after prayers, he was required to go to bed; but the elder Muir, one night in repeating the order added, "If you will read, get up in the morning and read. You may get up in the morning as early as you like." From that time throughout the winter Muir was up at one o'clock. Although his father protested, he was held to his promise. In this manner Muir gained five hours each day, the time being used partly with his books and partly in the mechanical inventions in which he became interested--thermometers, barometers, hygrometers, pyrometers, and clocks. His more complicated clock told not only the hour of the day, but the day of the week and the month, and also had attachments which upturned his bedstead setting him on his feet at the required hour in the morning, and other attachments to start the fire or light the lamp. The ingenuity which young Muir displayed in mechanical construction, had he followed this talent, undoubtedly would have given him a great career as an inventor. But such a life would never have satisfied his inner impulses. Hearing of a state fair at Madison, Muir was encouraged to exhibit his various contrivances there. The extraordinary merit of his work was at once recognized, and the instruments exhibited attracted much attention. It was his visit to the fair that drew him to the University. At Madison, Muir worked at any sort of thing, earning a few dollars. Of this he said4: "I was thus winning my bread while hoping that something would turn up that might enable me to make money enough to enter the state University. This was my ambition, and it never wavered no matter what I was doing. No university, it seemed to me, could be more admirably situated, and as I sauntered about it, charmed with its fine lawns and trees and beautiful lakes, and saw the students going and coming with their books, and occasionally practicing with a theodolite in measuring distances, I thought that if I could only join them it would be the greatest joy of life. I was desperately hungry and thirsty for knowledge and willing to endure anything to get it." "With fear and trembling, overladen with ignorance, I called upon Professor Sterling, the dean of the faculty, who was then acting president, presented my case, and told him how far I had got on with my studies at home, and that I hadn't been to school since leaving Scotland at the age of eleven years, excepting one short term of a couple of months at a district school, because I could not be spared from the farm work. After hearing my story, the kind professor welcomed me to the glorious University--next, it seemed to me, to the Kingdom of Heaven. After a few weeks in the preparatory department I entered the freshman class." Doing odd jobs during the term and working in the harvest fields in the summer, Muir maintained himself at the University for four years; but pursued those studies toward which he was attracted rather than a regular course. He was interested in all the sciences, and particularly in botany and geology. It was in his botanical studies about these Madison lakes that he first learned to wander. Upon leaving the University Muir says6: "From the top of a hill on the north side of Lake Mendota I gained a last wistful, lingering view of the beautiful university grounds and buildings where I had spent so many hungry and happy and hopeful days. There with streaming eyes I bade my blessed Alma Mater farewell. But I was only leaving one university for another, the Wisconsin University for the University of the Wilderness." John Muir's life work was that of an explorer and a student of nature. His travels, beginning in the region of the Great Lakes shortly after leaving the University, extended throughout the world, and continued to old age. His journeys carried him to Russia, Siberia, Africa, Australia, South America, and other remote regions little visited by the ordinary traveler. But his contributions to knowledge were mainly due to his studies in California and Alaska. It was inevitable that after reaching California Muir should be drawn by an irresistible attraction to the Sierra Nevada. His first visit filled him with burning enthusiasm; and during some ten years, he studied the flora, the fauna, the glaciers, and the topography of that superb range. His study of animals and plants was not that of systematic biology--the interior structures or methods of life growth--indeed was very unlike that in the biological laboratories of the present day. His interests were rather in the habits of the plants and animals and their relations to their neighbors and to their environment. Each animal or plant as an individual was a subject of interest to John Muir. The mighty silver firs, the sugar pines, the Douglas spruces, and the gigantic sequoia, were ever inspiring him; and he never ceased to write of their beauty and their majesty. However, he was no less moved by the dwarf cedars, pines, and oaks, which near the timber line carried on a brave struggle through the years against the terrific storms and prolonged cold of the heights. The wonderful variety and beauty of the flowers of the Sierra also deeply stirred him. With enthusiasm he sought and admired each species, whether found for the first time or an old friend. The animals and their habits thrilled him with delight. There have been no more appreciative nature studies ever written than that of the cheery, dauntless songster, the water-ouzel and that of the lively, demonstrative, and pugnacious Douglas squirrel. In short, his study of plants and animals was an appreciation of them as objects of nature, such as have been made by only two other Americans, John Burroughs and Henry Thoreau; and Muir worked on a far larger scale than either. He was one of the great interpreters of nature. Muir's interpretation of plant and animal life is always humanistic without being false or sentimental, as has been too frequently true of the modern nature writers. The rigid scientific man reads his descriptions with pleasure; and, while they are clothed with human warmth, he finds them in accord with strict truth. But John Muir's most profound emotion aroused by magnificent scenery, and this he ways saw in its relations to sky and cloud. "Along the eastern margin of the Great Valley of California rises the mighty Sierra, miles in height, reposing like a smooth, cumulous cloud in the sunny sky, and so gloriously colored, and so luminous, it seems to be not clothed with light, but wholly composed of it, like the wall of some celestial city. Along the top, and extending a good way down, you see a pale, pearl-gray belt of snow; and below it a belt of blue and dark purple, marking the extension of the forests; and along the base of the range a broad belt of rose-purple and yellow, where lie the miner's goldfields and the foothill gardens. All these colored belts, blending smoothly, make a wall of light ineffably fine, and as beautiful as a rainbow, yet firm as adamant. "It seemed to me the Sierra should be called not the Nevada, or Snowy Range, but the Range of Light. And after ten years spent in the heart of it, rejoicing and wondering, bathing in its glorious floods of light, seeing the sunbursts of morning among the icy peaks, the noonday radiance on the trees and rocks and snow, the flush of the alpen-glow, and a thousand dashing waterfalls with their marvelous abundance of irised spray, it still seems to me above all others the Range of Light, the most divinely beautiful of all the mountain chains I have ever seen." Muir's explorations of the Sierra brought to the public as never before the wonders of its river-worn ravines, its enormous glacier-cut canyons, its mighty cliffs, and its craggy peaks. From the fiery, dusty foothills to the white granite, snow-covered crests, he knew the Sierra as an intimate friend; and through his vivid writings, he communicated his glow to all admirers of the sublime in nature. After years of climbing in the Sierra, the magnificence of Alaska attracted Muir, and four times he visited that region. His explorations there represent the most important part of his geographic work; they added much to the knowledge of the Alaskan coast. A number of important inlets were mapped, the chiefest of which is Glacier Bay. In the latter was discovered the majestic glacier which bears Muir's name, a mighty stream of ice, in its broadest part twenty-five miles wide and having two hundred glacial tributaries. As compared with this, the greatest of the Alpine glaciers is a pigmy. Muir's close observations upon the motion and work of glaciers, first the small ones of the Sierra, and later the mighty ones of Alaska, were important contributions to the knowledge of these great agents of erosion. "It was easy to see that only a small part of the rain reached the ground in the form of drops. Most of it was thrashed into dusty spray, like that into which small waterfalls are divided when they dash on shelving rocks. Never have I seen water coming from the sky in denser or more passionate streams. The wind chased the spray forward in choking drifts, and compelled me again and again to seek shelter in the dell copses and back of large trees to rest and catch my breath. Wherever I went, on ridges or in hollows, enthusiastic water still flashed and gurgled about my ankles, recalling a wild winter flood in Yosemite when a hundred waterfalls came booming and chanting together and filled the grand valley with a sealike roar. "After drifting an hour or two in the lower woods, I set out for the summit of a hill 900 feet high, with a view to getting as near the heart of the storm as possible. In order to reach it I had to cross Dry Creek, a tributary of the Yuba that goes crawling along the base of the hill on the northwest. It was now a booming river as large as the Tuolumne at ordinary stages, its current brown with mining-mud, washed down from many a 'claim,' and mottled with sluice-boxes, fence-rails, and logs that had long lain above its reach. A slim footbridge stretched across it, now scarcely above the swollen current. Here I was glad to linger, gazing and listening, while the storm was in its richest mood the gray rain-flood above, the brown river-flood beneath. The language of the river was scarcely less enchanting than that of the wind and rain; the sublime overboom of the main bouncing exultant current, the swash and gurgle of the eddies, the keen dash and clash of heavy waves breaking against rocks, and the smooth, downy hush of shallow currents feeling their way through the willow thickets of the margin. And amid all this varied throng of sounds I heard the smothered bumping and rumbling of boulders on the bottom as they were shoving and rolling forward against one another in a wild rush, after having lain still for probably a hundred years or more." It is at the time of storm that the large work of erosion is done. The great storm of the year may do more work than all the other storms of the year; and possibly the great storm of the century more work than all the other storms of the century. John Muir's explorations of the Sierra and in Alaska were done alone. He had no pack train; his entire outfit he carried on his back, a sack of bread and a package of tea for food (as long as they lasted), his scientific instruments and his note books, constituted his load; he had neither rod nor gun, usually no blanket, and seldom a tent except when chance threw him in with others. This means to those who have been in the mountains and on the glaciers that Muir was wet for days and nights, that, throughout many nights he was cold, that he was frequently hungry; yet to these discomforts, which would be intolerable to a less hardy man, Muir appeared oblivious. Climbing in the mountains by one's self, as did Muir, is one of the most exacting of the physical arts. The semi-professional climbers, who climb in order to write articles for magazines, go with not less than two professional guides, the three being roped together. Only those who have done climbing will appreciate how unlike are the two methods. When three are roped together, if one makes a mistake, in all probability his life is saved. When a man is climbing alone on a steep or vertical cliff, his first mistake is likely to be his last. Neither hand nor foot can be moved except with the exercise of sure judgment, and with the nicest precision. Muir was able to do what he did only by possessing a most wonderful combination of clear eye, unfaltering nerve, and limbs of great strength and endurance. 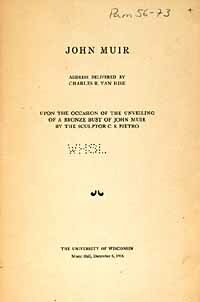 John Muir's books, in the matter of personal safety, are in marked contrast with those of many mountain climbers. One finds danger only occasionally mentioned. In order to appreciate Muir's marvelous, almost uncanny skill as a climber, it is necessary to go to the writings of others who have had the good fortune to see Muir at work. With remarkable speed, unflagging energy, and nerves unshakened, he would climb on dangerous ground for twelve, fourteen, or sixteen hours without rest; and on one remarkable occasion when a life was at stake his mountain work extended throughout the night, during which he had not only himself to guide, but to lead and carry his crippled friend over very difficult ground in the darkness. The same qualities were shown in Muir's glacial work. To explore glaciers alone, and especially unknown glaciers, requires great agility and endurance, constant skill, steady coolness, and never failing watchfulness. To jump innumerable crevasses, to cross those too wide to jump on ice bridges, are a severe strain upon the nerves of any man; and yet Muir, on one of his trips of exploration, dragging a heavily loaded sled over the rough ice or pushing it ahead of him across the ice bridges, worked day after day alone on the vast glacier that bears his name. The man who goes out to the wilds alone is a true lover of nature, not a lip worshipper. The mighty forests are sometimes so soundless that the ear hears only the circulating blood; at other times are a tumultuous mass of tossing boughs, swaying limbs, and crashing trunks. In the impenetrable darkness of the forests at night, it is as if the eye did not exist; but the tense ear may catch a myriad mingled sounds--the moaning of the trees, the falling of the waters, and the joyful, weird, or angry cries of fowl and beast. In the day the eye may sweep over the endless plain, leap a hundred miles to the distant mountain peak or attempt to penetrate the grey mist hanging over the crevasses of the glaciers. To be alone with nature, oppressive and terrifying to the city born, was a delicious pleasure to Muir. Indeed it was with almost delirious joy that he felt himself to be a part of the handiwork of the Almighty. To him cliff, air, cloud, flower, tree, bird, and beast,--all were manifestations of a unifying God. The great public service of John Muir was leading the nation through his writings to appreciate the grandeur of our mountains and the beauty and variety of their plant and animal life, and the consequent necessity for holding forever as a heritage for all the people the most precious of these great scenic areas. Probably to his leadership more than to that of any other man is due the adoption of the policy of national parks. Of a man who is likable, it is a commonplace to say that all who knew him loved him; but this was so intensely true of Muir that one feels he should have a stronger word than love. For his friends, mingled with love, were ardent admiration for his tall, thin, sinewy frame, and almost worship for the inner fire which burned upon his strong and noble face. "Finally Muir broke the silence. 'Yon's a brave doggie,' he said. Stickeen, who could not yet be induced to eat, responded by a glance of one eye and a feeble pounding of the blanket with his heavy tail. "Then Muir began to talk, and little by little, between sips of coffee, the story of the day was unfolded. Soon memories crowded for utterance, and I listened till midnight, entranced by a succession of vivid descriptions the like of which I have never heard before or since. The fierce music and grandeur of the storm, the expanse of ice with its bewildering crevasses, its mysterious contortions, its solemn voices were made to live before me. "When Muir described his marooning on the narrow island of ice surrounded by fathomless crevasses, with a knife-edged sliver curving deeply like the cable of a suspension bridge' diagonally across it as the only means of escape, I shuddered at his peril. I held my breath as he told of the terrible risks he ran as he cut his steps down the wall of ice to the bridge's end, knocked off the sharp edge of the sliver, hitched across inch by inch and climbed the still more difficult ascent on the other side. "But when he told of Stickeen's cries of despair at being left on the other side of the crevasse, of his heroic determination at last to do or die, of his careful progress across the sliver as he braced himself against the gusts and dug his little claws into the ice, and of his passionate revulsion to the heights of exultation when, intoxicated by his escape, he became a living whirlwind of joy, flashing about in mad gyrations, shouting and screaming 'Saved, saved!' the tears streamed down my face9." It was especially fitting that, in recognition of Muir's great public service to conservation through advancing the movement for the creation of forest reserves and national parks, the University of Wisconsin, many years after his regretful farewell, granted him her highest academic honor, the degree of Doctor of Laws. It is indeed fortunate and most appropriate that through the decades and centuries to come, the youth of the University may behold this beautiful bronze bust which has so faithfully caught the thoughtful countenance of Muir, as if in meditation upon the meaning of the order of the Universe--which so prolifically creates, which so lavishly destroys, and which through innumerable alternations of life and death in some mysterious way ever climbs to higher things. 1 The Story of My Boyhood and Youth, John Muir (Houghton-Mifflin Co. 1913) pp. 46 and 47. 2 The Story of My Boyhood and Youth, p. 71. 7 The Mountains of California, John Muir (The Century Co.) pp. 4-5. 8 The Mountains of California, John Muir, p. 262-3. 9 Alaska Days with John Muir, S. Hall Young. pp. 187-88. Van Hise, Charles R. John Muir. Madison: University of Wisconsin, 1916.